It’s hero time! And anyone can be a hero. 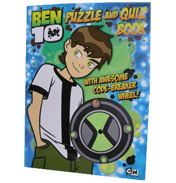 Ben Tennyson was an ordinary ten-year-old schoolboy until the one Summer day that he came across a mysterious device called an omnitrix at the site of a crashed meteorite. It would change his life forever. He put the strange watch-like device on his wrist and he discovered that it allowed him to transform into an endless choice of different alien forms which each have their own unique powers and abilities. However, in those different states he still keeps his own ten-year-old mischievous personality. With help from his cousin Gwen and Grandpa Max he is able to continually defend against various threats to save the day and consequently the world. Although she is the same age as Ben, Gwen is usually the voice of reason and sometimes has to stop Ben from rushing into situations without thinking things through and planning ahead. 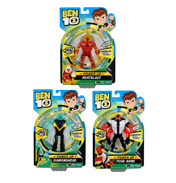 The evil warlord, Vilgax, is a common enemy to Ben, as he will stop at nothing to retrieve the omnitrix, which he aims to use as a weapon. 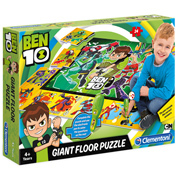 So a typical day for Ben would be to transform into lots of different alien superheroes, fight against the evil wrongdoers, save the world and not forgetting…occasionally getting into some kid-style trouble! Although he realises the importance of his incredible responsibility, he often uses his powers to satisfy his own youthful curiosity. The original series of the show was shown from 2005-2008. 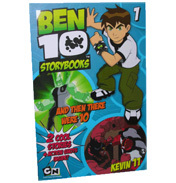 In the sequel of the show, Ben 10 Alien Force, Ben is now aged 15. 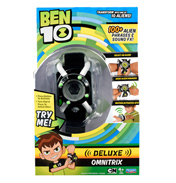 As his character develops and he meets and defeats more and more enemies, Ben is forced to sacrifice the omnitrix by making it self-destruct. All is not lost, however, as he is successful in taking a more advanced version of the technology, the Ultimatrix, from Albedo. 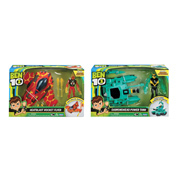 This new version allows Ben to be even more powerful than before. 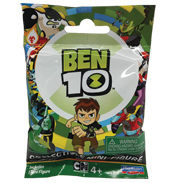 When Ben turns 16, the show becomes Ben 10 Ultimate Alien, originally shown in 2010, and at the age of 30 onwards the show is known as Ben 10,000. 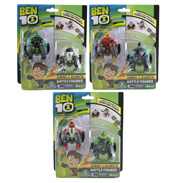 Throughout the different versions of the shows there have been a multitude of aliens into which Ben has transformed. 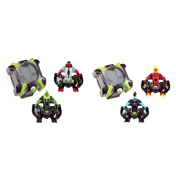 When first found the omnitrix allowed transformation into only ten different aliens; Wildmutt, Four Arms, Grey Matter, XLR8, Upgrade, Diamondhead, Ripjaws, Stinkfly, Ghostfreak and Heatblast. 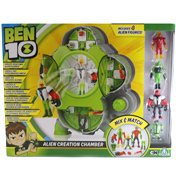 For 2011 we have the new Ultimate Alien series from Bandai, consisting of Alien Figures, Creation Chamber Figure Sets, Ben's Mark 10 Car, Alien Disk Ultimatrix, Legacy Omnitrix Rustbucket III and Alien Creation Transporter. 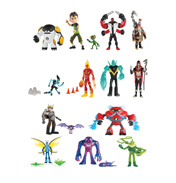 For 2012 we have the new Omniverse series from Bandai, consisting of 10cm Alien Collection Figures, Hyper Figures, Tenn-Speed Cycle Vehicle, Intergalactic Plumber Set, Rook’s Pro-Tool and much more!